I recommand Raulglezruiz for illama seeds. Tropical Fruit Discussion / Re: THE BEST ANNONA RETICULATA I HAVE EVER EATEN!!!!! I wish to buy some seeds..
My soursop flowers with new growth, but it has nothing to do with removing leafs. I have never had to remove leafs to start flowering. Thanks. I'll wait without removing the leaves. Yuza is using tea like lemon tea during winter season. I know illama ,sugarapple, cherimoya flower come with new leaves. Rollinia ,soursop flower also come with new leaves? If yes, i should be removed all leaves. Tropical Fruit Discussion / Re: Sibu: a rare fruit supermarket ! I wish to eat Buah langir & Mawang. Wow welcome back to forum. He is really good seller, perpect packing. I wish to buy some cupui, cupuacu seeds next year. Tropical Fruit Discussion / Re: What avocados can live in -10C? I will try to get the seeds to follow your advise. Tropical Fruit Discussion / What avocados can live in -10C? The winter temperatures in this area drop to -10C. Avocados can live here in the outdoor? looks really good. is there any seeds in the fruit? Let me know your paypal address. I have sent you a message, I still have a few. Yes Sometimes we can buy australia blood orange in the local market. Yes it is difficult to findind variety. 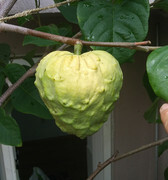 Today i harvested my cherimoya. But i know only it is cherymoya. Somebody help to find variety? Tropical Fruit Discussion / Re: Growing Ilama (Annona Diversifolia) from seed. I think illama don't like to growing in the greenhouse. When i moved in the greenhouse or room, leaves are dropped and has some black spot like below pic. So i moved in the greenhour or room during winter, make environment like dry season. (Temp 12~13c and little water.No leaves). Fillany i see flowers first time. Maybe 3 years... but No fruit. It really looks like pumpkin. There are some that have more of a sweet component to the sour but none that I have ever tried which are pure sweet. The orange ones in your scale are fully ripe, and would have the best potential flavor. That green one in your hand was picked a bit too early and will be fully sour. yes for sure, I have tasted fruit from over 40 seedlings, from several sources...some just better than others...and they must be eaten at the perfect time...too early is bad, too late maybe even worse. Usually ripe is orange, but i have some that never turn orange, and stay yellow...I should have grafted trees by next season, but I'm still in the process of picking my favorites to graft. Which month is your harvast time of Annona? I want to buy some Annona seeds which big and low seeds. Great for Ice tea instead of lemon though. Oh... Lemon Ice tea is not a favorite in my country. So I didn't thich about..